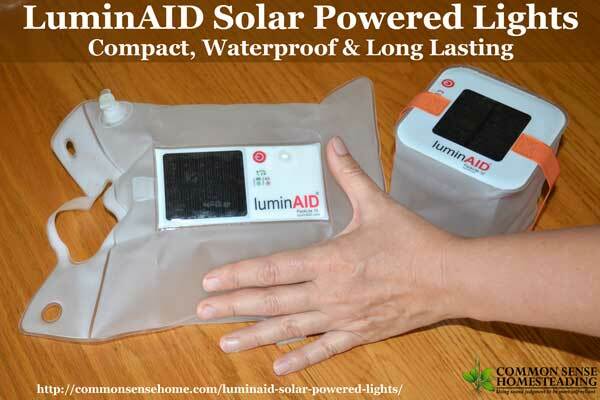 LuminAID solar powered lights are unique, lightweight, durable, IPX7 waterproof, inflatable lights. Ever since I saw them on Shark Tank back in 2015, I thought the company was on to a good idea. I received two great little LuminAID solar powered lights for review – the cube-shaped Packlite 12 and the pillow-shaped Packlite 16. Both units pack down tiny for storage – roughly the size of two decks of playing cards. They can charge while folded or inflated. To use, simply blow up and press the button and select your preferred light level. These units are a substitute for a camp light or lantern, with enough light for small room or reading a book (near the unit – think “lamp”, not “floodlight”). Once charged, the units will hold that charge for up to two years. This means you can keep a charged unit in your first aid kit, emergency preps or glove compartment and and have light when you need it. 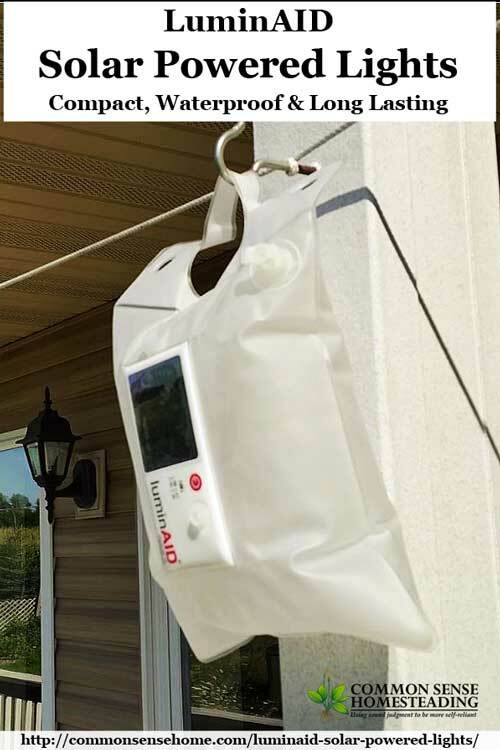 The smaller LuminAID Packlite 12 square light is a good tabletop unit, or it can be hung or carried like a lantern. The flat bottom gives it a small footprint (just 4″x4″), so it's perfect for small spaces. I could easily see it being used to gather eggs in a coop without electricity, or for camping. The “twist to store” feature of this light makes it easy to pack up quickly. 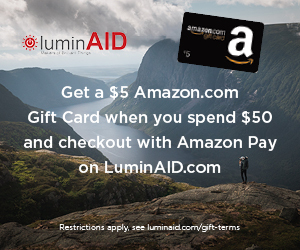 To share light with those in need, the LuminAID “Give Light, Get Light” Package allows you to purchase of Packlight 16 for yourself while donating one to someone in need in Haiti, where they are recovering from Hurricane Matthew. We just received our solar lights this summer, so we'll keep using them to see how they hold up over time. I've noticed some amazon.com reviews indicating that there may be some quality control issues to work through. The majority of reviews are positive. 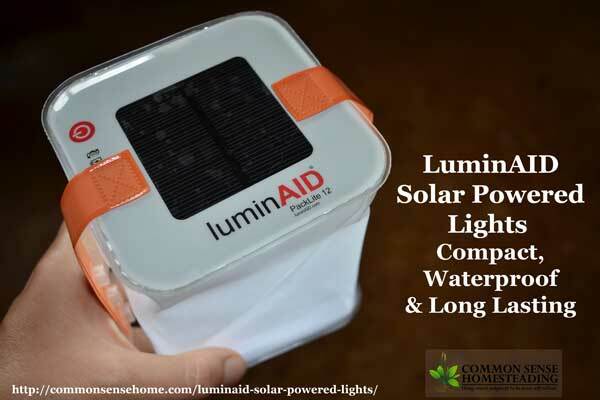 Have you used solar lighting or solar emergency products? If so, what do you recommend? Are there any that you've seen that you'd like to see me review? Leave a comment and left me know! Current offer (May 2017) – Buy two luminAID Packlite Spectra color changing lights, get one free. I took years of bumping into stuff in the flashlighted dark before I realized that my eyes see far, far better with diffused light. Discovering this was an accident. I was camping, pawing through a jumble of stuff in my tent with one of those old, clunky d cell batteries that were a rectangular block with a lamp mounted to it. The light was blindingly bright in a 4 inch diameter circle on the floor, but not much help in the rest of the tent. A translucent plastic cup flopped onto the flashilght and covered the lamp. Voila! Diffused light made everything visible despite the dimmer light. My husband loves solar charged anything. I’ve got to show this review to him! Roadeavour should have something like this too. Eco friendly light!